Predictive Analytics – A Project or a Program? Our AMEX credit card was recently compromised. Someone got hold of the card information and Petro Canada charges started to rack up. Amex spotted this suspicious pattern and immediately initiated a fraud alert thru multiple touch points. What does your credit card company know about you? A lot…maybe more than your spouse. A study of how customers of Canadian Tire were using the company’s credit cards found that 2200 of 100,000 cardholders who used their card at drinking places missed four payments within the next 12 months. By contrast, only 530 of the cardholders who used their card at the dentist missed four payments within the next 12 months. So drinking is a predictor of credit risk. Predictive analytics is not a fad. It’s not a trend. In a real-time world, Analytics is a core business requirement/capability. However, many organizations flounder in their efforts not because they lack analytics capability but because they lack clear objectives. So the first question is, What do you want to achieve? Analytics so far has largely been a departmental ad hoc activity. Even at the most sophisticated corporations, data analytics is a cumbersome affair. Information accumulates in “data warehouses,” and if a user had a question about some trend, they request “data priests/analysts” to tease the answers out of their costly, fragile systems. This resulted in a situation where the analytics are done looking in the rearview mirror, hypothesis testing to find out what happened six months ago. Today it’s possible to gather huge volumes of data and analyze it in near real-time speed. A retailer such as Macy’s that once pored over last season’s sales information could shift to looking instantly at how an e-mail coupon impacts sales in different regions. Moving to a realtime model and also building an enterprise level “shared services” model is going to be the next big wave of activity. Predictive analytics deals with extracting information from data and using it to predict future trends and behavior patterns. Wal-Mart is famous for using data analysis to adjust its inventory levels and prices. But the real transformative use case is Credit scoring (e.g., FICO score), which has impacted everyone’s life. Scoring models process a customer’s credit history, payment history, outstanding loan balances, purchase data, etc., in order to rank-order individuals by their likelihood of making future credit payments on time. But all that is old school, compared to how predictive analytics is powering the next generation of retail marketing spend across online, brick & mortar and mobile. It’s interesting to see how much new marketing activity is now happening thru Facebook targeting the 800M user community. The focus is on leveraging peer recommendations, sentiment and buzz (via text analytics on Twitter). The sophistication is in multi-dimensional mashup analysis: analyzing the social network and analyzing the “look and click” data and effective search terms (e.g., Google Adwords). The economics of predictive analytics is shifting also. A wave of startups are finding ways to use cheap but powerful methods (e.g., Hadoop) to analyze new categories of data such as Twitter feeds, blog posts, videos, photos, tweets, DNA sequences, and medical images. So if Predictive Analytics around customer profitability, targeting, churn reduction, inventory turns, pricing, promotions and supply chain optimization is a core requirement and the economics are getting favorable…then how do we structure the organizational capacity? Should this be centralized for leverage in a shared services model or left to each function or department to execute as a project. HOW MUCH (what will it cost? How is it funded? How much inhouse CapEx vs. OpEx?). But to answer these questions you need some clarity of scope…Is predictive analytics (powered by big data, information management or BI) a departmental or functional project or a enterprise level program? Your boss is gung-ho for predictive analytics, and there’s plenty of excitement, momentum, anecdotes and public case studies fueling the flames. Is the excitement sufficient to gain buy-in for a promising predictive analytics initiative, equip business users with a leading solution, and pull the trigger? Are you destined for success or disappointment? Well it depends…. on whether you are executing a enterprise wide program or a narrow project. If you treat predictive analytics as a project-by-project then the charter is narrow…. how do I execute a Facebook gateway project or text analytics on Twitter? How do I execute a SAP HANA project for powering the order, inventory or available-to-promise analysis? How do I execute a GreenPlum data applicance project for insurance claims? How do I extend my legacy application to incorporate Hadoop for multi-channel promotions? How do we implement Oracle Exalytics, Exalogic or Exadata for call-center call analysis? How do I upgrade my data centers to handle Big Data? If predictive analytics is a program (e.g., leveraging the motherlode of Facebook data as a program), then the scope and charter are much more complex. Corporations contemplating an Analytics or Big Data program should assess their readiness to move forward (WHY, WHAT, HOW, WHO), and systematically develop roadmap/capabilities by creating a strategy/charter/PMO for the overall program. Enterprise level programs require leadership and governance. One of the leadership challenges of Enterprise BI, Analytics-as-a-Service and Big Data, is executing a systematic project/program that will change the organization (and processes) and not just be a one-off project with diminishing returns. Programs require tenacity, structure and discipline. History tells us that large enterprise projects are fragile and require much more extensive cross-functional cooperation than most sponsoring firms are bringing. Unlike processes, which are often aligned with business unit responsibilities, data frequently crosses organizational boundaries and doesn’t carry with it a clear line of responsibility. Seemingly small mistakes in upfront data centric design can generate a cascade of failure in execution. Predictive analytics is all about strategy and framework, rarely is it about tools or techniques. After being involved in several change programs, I strongly believe that to succeed in institutionalizing analytics you need a change framework that demystifies technology, serves as a foundation and confidence builder, and is durable across industries, and is simple in nature. I think I found one such framework that based on my experience actually works. The simple framework from Charlie Feld detailed in his new book – Blind Spot: A Leader’s Guide To IT-Enabled Business Transformation – where he distills the experience gained from running multiple complex IT change initiatives. The firms his team has impacted include Frito-Lay, Burlington Northern Santa Fe, Delta Air Lines, Home Depot, Southwest Airlines and FedEx. Charlie Feld’s transformation framework I think has wide applicability in a transformative Analytics, Big Data, Analytics-as-a-Service or Mobile BI landscape. It applies to startups building products as well as large firms implementing a platform. It consists of the four elements of a change agenda (WHY, WHAT, HOW, WHO) and the five time-boxed phases of the Journey from Current State to the Future Vision. Data is the new fuel that powers predictive power. The bigger the data set…the more statistically significant the insights. Data powered predictive analytics encompass a variety of techniques from modeling, machine learning, data mining and natural language processing that analyze current and historical facts to make predictions about future events. Who doesn’t want to predict the future? But it’s not that easy. Big companies don’t change easily. So the logic and outcomes must be compelling via a strategy that elaborates…why should my organization adopt Predictive Analytics extensively. So why change what what we are doing? WHY change (WHY do anything?). Every journey should begin with a well articulated “call to arms” or WHY do anything. A clear articulation of WHY, will enable the organization to mobilize, make investments, set priorities, take risks, and sustain the effort. It is the business imperative that must be articulated by the core team, or there is no point in launching a major project costing millions of $$. Crafting the WHY is the responsibility of the core team. The WHAT to change (WHAT will we do?). Assuming the WHY change is compelling and can be clearly stated, it becomes critical to describe what actually needs to be done and how to breakdown the departmental silos. According to Feld, it’s important to describe what needs to stay the same. These conversations are going to be difficult and gravitate toward legacy versus new platforms, centralization (BI Center of Excellence model) versus decentralization (a free for all); outsourced versus insourced; or public cloud (AWS) vs. private cloud themes. A more appropriate dialogue should be focused on what Analytics-as-a-service, Big Data elements should be common/leveraged and what should be unique. Not doing this right has consequences over time. The example below shows an IT transformation within Frito-Lay. But the same concept can be applied to every data project. This is the pathway from your current to your future state. It is focused on the proper construction and consumption model. This is all about building a blueprint, quality engineering and disciplined program and project management. The HOW will require readiness assessments, which may be performed internally or using external resources, provide an objective evaluation of the firm’s knowledge, culture, technical environment, data, processes and structure to determine what adjustments (if any) are necessary to maximize the potential for success. The HOW needs to deal with the frustration of business users who are openly revolting against long deployment cycles, high costs, complicated upgrade processes and IT infrastructures demanded by traditional IT approaches and solutions. The human aspect is the part of the framework that is required for sustained success. There are four components that differentiate one enterprise from another: Organization, Leadership, Culture and Performance. They all matter whether you outsource, smartsource or go it alone. The WHO will require assessing the maturity level. What is the maturity level of my organization to lead and drive change today? What should be our target maturity level for our organization based on where we are? What people and technology assets and emotional intelligence (EQ) do we need to advance from where we are to where want to be? Enterprise level projects are multi-year marathons. They require a lot of sustained effort and stamina. relatively early in the Analytics Journey (Strategy, The Turn, Up & Running, Hitting Stride, and Self Sufficiency). The five distinct phases of the journey framework are where the project and leadership team implements the organization’s change agenda. Each phase has certain characteristics and outcomes that need to be constantly monitored and managed. 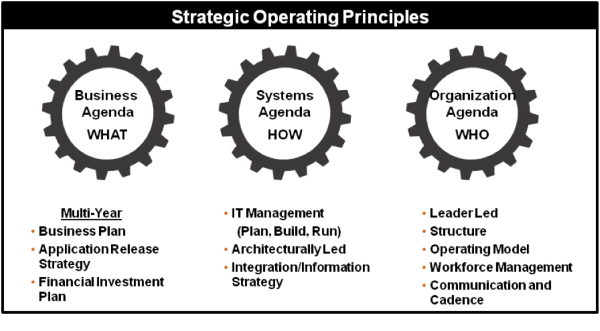 Phase 1 (Strategy) – In this phase the strategy is articulated by the executive team. Phase 2 ( The Turn) – The work in this phase consists of sequencing, pacing and funding the Journey from Current State to Future State. Phase 3 (Up and Running) – The deal has been cut, the sequencing has been agreed to and the roadmap has been blueprinted. This phase is about beginning to deliver. Phase 4 (Hitting Stride) – This phase is about accelerating quality delivery and agreed to benefits of the change. Phase 5 (Self-Sufficiency) – This final phase is about industrialization of the new model and continuous improvement. Initiating a analytics program represents a change to the way data and information will be provided and used. Analytics is all about strategy and framework, rarely is it about tools or techniques. Predictive Analytics-as a service is beginning to happen….a core competency that is a shared services capability… it’s a paradigm shift that is part of the overall evolution towards “IT-as-a-Service” operating model that is driven by “transforming IT.” We can see this disruptive service centric operating model shift manifest itself in different ways… Infrastructure-as-a-service, platform-as-a-service or software-as-a-service. A similar shift is taking place in enterprise analytics and big data….how to move from silo’s (data in applications) to leverage models (data as a common asset). We saw this with large scale ERP to web services implementations and are revisiting this theme around Analytics. These shifts are not going to be easy within large companies. Change in organizations is unfortunately like running marathons back to back. As soon as you finish one marathon, you are at the starting line of another one. 7. IT-as-a-Service is transforming IT… It’s not just about transforming the infrastructure. It’s about transforming the role CIOs and IT managers perform in the enterprise: less devoted to break/fix, repair and maintenance, and more time and dollars devoted to discovering new value for the business, being more innovative and less reactive. 8. Analytics innovation accelerated during World War II. British and U.S. mathematicians developed new problem-solving approaches that form the basis of business analytics. At the time, scientists were trying to solve the problem posed by German U-boats that were sinking the ships carrying arms and provisions to Britain. Data scientists came up with large-scale mathematical models, and figured out how to minimize supply ship attrition. This was called optimization, and gave birth to operations research, one of the pillars of analytics.